Google has updated its search engine for mobile users with a small but handy feature that lets you hail cabs straight from results pages. The next time you search for directions to a location in the Google app on your iOS or Android device, you’ll see options to hail a cab below the map, along with real-time fare estimates and wait times. Tapping through will launch the cab service’s app you have installed, so you can proceed to book your ride with your location and destination pre-filled. The new feature seems to be available internationally, as we found when testing it in India and The Netherlands. 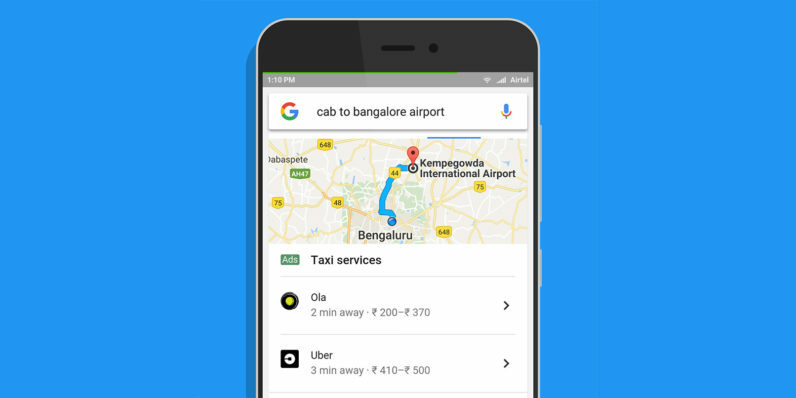 It works well with Uber, but not so much with Ola in India: After selecting the local cab service from my search results for Bangalore’s international airport, I still had to manually enter my destination when the app launched. In case you don’t have the necessary app installed, Google will link you to the app store to download it for your device.